Before you bother to read this, first ask yourself these questions. If I told you that in 2006 several former Weather Underground terrorists linked up with the Communist Party USA (CPUSA), Committees of Correspondence for Democracy and Socialism (CCDS) and Democratic Socialists of America (DSA) to form an activist support group, would you do any more than yawn? If I were to say that two of those former terrorists were Bill Ayers and his wife Bernardine Dohrn, would your ears prick up-ever so slightly? If I then revealed that several leaders of this organisation went on to create a satellite group, specifically designed to help Barack Obama win the US presidency, would you start to get a little bit interested? 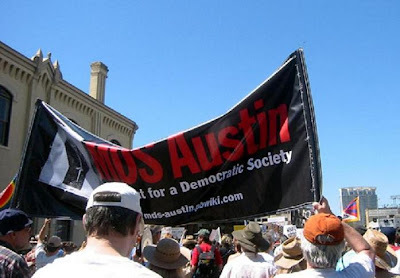 The organisation in question is Movement for a Democratic Society (MDS)-the namesake of the '60s support group for the ultra radical Students for a Democratic Society (SDS). The new MDS is in fact a lot like like the old MDS-it even has many of the same people. MDS is a community support group for the new SDS (also founded in 2006), which now has 130 chapters in colleges and high schools nationwide. What distinguishes the new MDS from the old, is the wider composition of its leadership. MDS links old SDSers and Weathermen to old line Marxists-Leninists from the CPUSA and CCDS and anarchists and Marxists from DSA. Noam Chomsky-Well known linguist, writer and activist. A member of both DSA and the CCDS. Carl Davidson-A founder member of SDS, later a Maoist ativist before becoming a leader of CCDS in 1992. Based in Chicago, Davidson is a long time personal friend of Bill Ayers. Angela Davis-A leader of CCDS, formerly prominent in the CPUSA. Bernardine Dohrn-Former SDS and a core leader of the Weather Underground. Bill Fletcher Jr-A former Maoist. A leader of DSA and an official in the AFL-CIO. 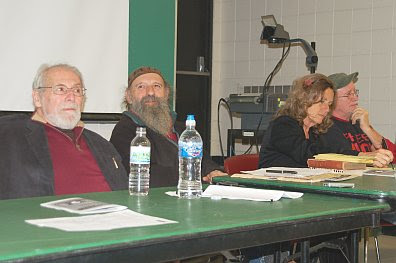 Bert Garskof-Involved with SDS the '60s, a close friend of Bill Ayers and Bernadine Dohrn. Tom Hayden-Founder and former leader of the SDS. Michael James-A former member of SDS. Robin DG Kelley- A former member of the Communist Workers Party, more recently close to the CPUSA. Michael Klonsky-Son of CPUSA member Robert Klonsky. A former member of SDS, who later led the pro-Chinese, Communist Party (Marxist-Leninist). Mike Klonsky is a long time friend of Bill Ayers and works closely with him on educational projects. Charlene Mitchell-A leader of CCDS, formerly an high ranking member of the CPUSA. 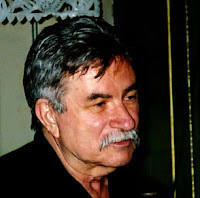 Mark Rudd-A former leader of the SDS and a core leader of the Weather Underground. Howard Zinn-A well known leftist historian and self described democratric socialst. Manning Marable-MDS chairman. A founder of DSA and now a leader of CCDS. Barbara Ehrenreich-An honorary chair of DSA. Jeff Jones-Former SDS and a core leader of the Weather Underground. Paul Buhle-Former SDS, now prominent in DSA. Bruce Rubenstein-MDS treasurer and a former Weatherman. Thomas Good-A communist turned anarchist who describes himself as an "unrepentant Weather supporter". Bill Ayers's wife and comrades are all here-but where's Bill? Though not a known board member, Ayers is definitely involved in MDS. Below is a video of Bill Ayers speaking at the November 2007 MDS "Convergence" in Chicago. Note Ayers's reference to MDS as "our work" and his enthusiasm for building alliances and using the US elections to enlists "hundreds of thousands" of young people to his cause. Also note reference to Rashid Khalidi, an unsuccessful MDS board candidate, pro-Palestinian activist and close friend of Barack Obama. It's clear that former Weather supporters form a significant bloc in MDS. Many of the others also connected. Several worked together in the mid 1990s in the New Party. A front for the radical community organisation ACORN, DSA and Committees of Correspondence, the short lived New Party was set up to help elect left wing candidates through the Democratic Party. MDS board members Noam Chomsky, Bill Fletcher, Barbara Ehrenreich, Manning Marable and Howard Zinn were all named as New Party leaders on this (circa 1995) NP document. Barack Obama joined the New Party in Chicago and enlisted NP help for his successful 1996 Illinois State Senate campaign. Though not listed above, MDS board member Carl Davidson was also a leader of the New Party in Chicago, where he worked closely with Obama. After the New Party folded, Bill Ayers's buddy Davidson continued to support Obama. Davidson, in conjunction with another MDS supporter Marilyn Katz organised the 2002 Chicago peace rally where Obama first came out publicly against the Iraq War. It is well known that Bill Ayers and Bernardine Dohrn helped launch Barack Obama's political career in their Chicago living room in 1995. The Chicago New Party also helped Obama's career that year. Interesting that the two "factions should come together 13 years later. Early this year MDS board members Tom Hayden, Bill Fletcher and Barbara Ehrenreich joined with radical actor/activist Danny Glover to set up a new organisation-Progressives for Obama. It is clear that MDS and Progressives For Obama are intimately connected. The Progressives for Obama website is run by MDS board member Carl Davidson. The site is endorsed by MDS board members Paul Buhle, Robin DG Kelley, Thomas Good, Michael James and former Weatherman Mark Rudd. MDS supporter Marilyn Katz has also signed up, as has Frances Fox Piven, a DSA activist and former New Party leader. Unlike several MDS board members, Mike Klonsky DID NOT endorse the Progressives for Obama website. However his wife Susan and his brother Fred (both former SDS members) did. The website also links to an online petition where you can sign up to support the cause. Signatories include MDS board member Jeff Jones and other two former members of the Weatherman inner circle, Howard Machtinger and Steve Tappis. Jennifer Dohrn, a former Weather supporter and sister of Bernardine Dohrn has also lent her name to the Obama cause. MDS linked news site Next Left Notes, (edited by Thomas Good) also carries a prominent link to Progressives for Obama. MDS and Progressives for Obama link several strands of the pro-Obama movement. They connect at least seven former Weathermen, (including Ayers and Dohrn), with the former core leadership of Barack Obama's New Party. Communist Party USA, Committees of Correspondence and Democratic Socialists of America, all of which have strongly backed Obama also form part of the matrix. This is NOW-not when Obama was eight years old. Just how smokey does the gun need to get?